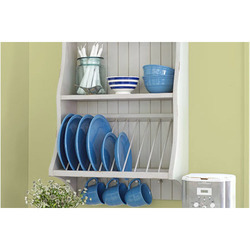 Our product range includes a wide range of wall mounted steel kitchen rack. Leverage on our vast industry experience, we are engaged in offering an optimum quality Wall Mounted Steel Kitchen Rack that is mainly used in homes. The offered rack is designed & crafted using premium quality basic material and cutting-edge technology in compliance with the current market standards. Available in a classic look and attractive design, our offered rack is highly renowned in the market. Apart from this, our offered rack can be availed by our clients' at an economical price.